The Farr Out Family: Crawling???????? Oh my... we have a mobile girl! Well she isn't full blown crawling yet but she is sure getting around. We have had so much fun throwing things in front of her to get. So far the things that work best to get her to crawl are cell phones, rings, and last but definitly not least, her binky. She is getting better and better each day. She would put her thumb in the hole and shake it. She was having so much fun. AHHH... whats on my head? A sweet girl in a pretty dress. On Sunday, we got to attend the Oquirrh Mountain Temple Dedication. It was so neat to go. President Monson gave a great talk and you could feel the Spirit so strong. 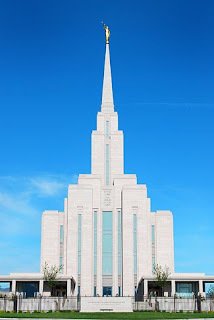 I love temples!!! We had no idea that you guys had had a baby too! Congratulations. Babies are so fun. We loved all of the pictures on your blog and are excited to follow you. Looks like the sink was a big success. We are so happy to hear that Jordan is getting closer to being finished with his exams!